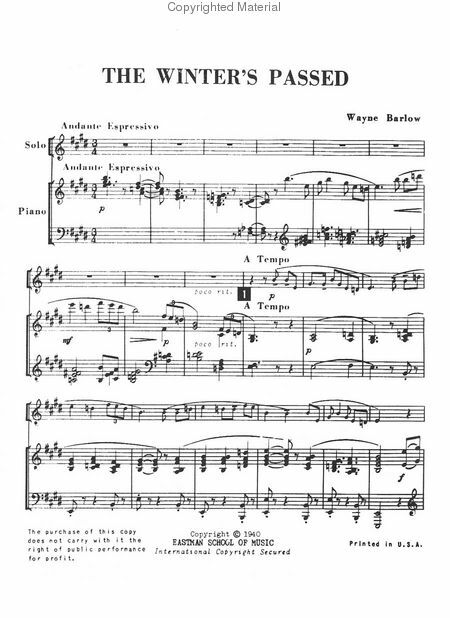 Wayne Barlow Interview with Bruce Duffie . . . . . .
Wayne Barlow (1912-1996), professor emeritus of composition, entered the Eastman School in 1930 and received his graduate and undergraduate degrees. In 1937, he was awarded a Ph.D. in music (composition) here, becoming the first person in the United States to receive such a degree. He also spent time at the University of Southern California, where he studied composition with Arnold Schoenberg. 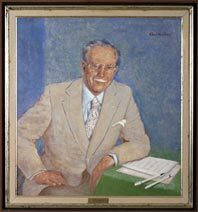 Before completing his doctorate, Howard Hanson asked him to join the faculty. 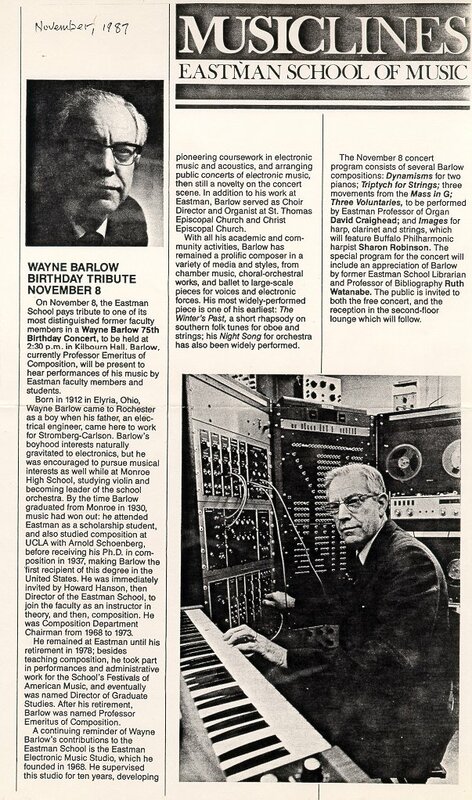 A pioneer in the field of electronic music, Dr. Barlow founded the Eastman Electronic Music Studio in 1968. He was chair of the composition department from 1968 until 1973, and dean of graduate studies from 1973 until his retirement in 1978. His compositions include sacred music, works for chorus and symphony orchestra, and pieces for chorus and pre-recorded tape. 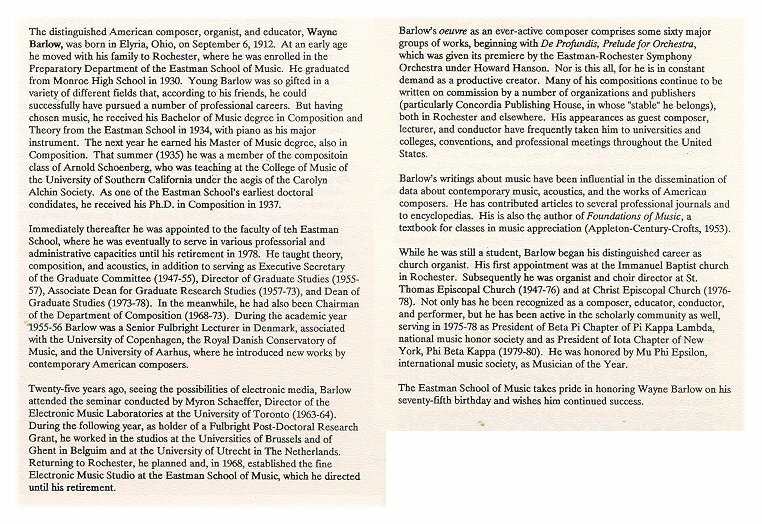 Throughout his career as a composer, Dr. Barlow received numerous awards and honors, including several ASCAP Awards. His works were commissioned by the Indianapolis Symphony, the Catholic Diocese of Rochester, the Penfield School District, and the Brevard School of Music. He was in demand as a guest lecturer and visiting artist and professor, specializing in topics such as electronic music, 20th-century composition, musical acoustics, and the American composer Charles Ives. 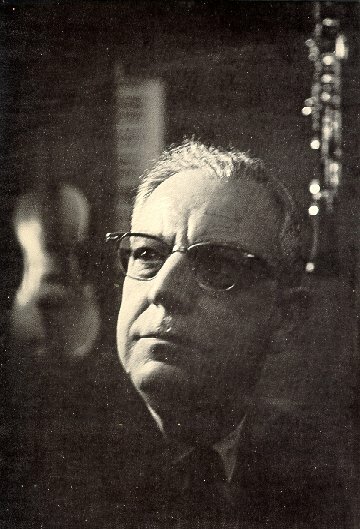 In 1955-56, Dr. Barlow was the Senior Fulbright Lecturer at the University of Copenhagen, the Royal Danish Conservatory of Music, and Aarhus University in Denmark. In 1964-65, he received a post-doctoral grant to research work in the electronic music field in Belgium and Holland, at the Universities of Brussels, Ghent, and Utrecht. In Rochester, Dr. Barlow also served as music director at Christ Episcopal Church and choirmaster at St. Thomas Episcopal Church. In a few other presentations of this series, I have mentioned how coincidence played a role. One guest might give me contact information for another, or an unexpected guest would also be available with the scheduled appointment. In the case of Wayne Barlow, the connection was not made at the time, but rather at this much later date when both interviews were being prepared for this website. "I met Dr. Barlow when I lived in Rochester, N.Y., since I was a student at the Eastman School of Music at that time. What I do remember about Dr. Barlow was his kindness as a person and teacher. Years later, when I was working in ASCAP, Dr. Barlow came to visit the office in New York. I was asked to speak with him and find out what ASCAP could do for him. I remember how delighted he was when I told him that I was one of his former students at Eastman. I showed him around the office, including the index department where information about his works were on file. He was genuinely delighted to learn all about the workings of the office. Most especially, I remember him as a very sweet and kind gentleman. Dr. Barlow was more interested in his students than in his own career. I missed him as soon as I left Eastman and so it was a great delight to cross paths with him again at ASCAP." Wayne Barlow is certainly not a name that most listeners are familiar with, but his output was rich in harmonious music. Fortunately, a couple of his works appeared on major recordings with the Eastman-Rochester Orchestra conducted by Howard Hanson. One other was issued with limited circulation (see portion of cover immediately below), but it probably can be found in a few libraries, and the material is always available for further distribution. In the fall of 1988, I was able to make contact Wayne Barlow and arrange a conversation on the telephone. He was surprised, but pleased that I had this interest, and our encounter was engaging for both of us. He was glad to be informative and responded graciously to my inquires. A few weeks following the phone call, he sent me other materials to use on the air. When the connection was made, I immediately told him how much I enjoyed the two recordings which were available, and we pick up the conversation right there . 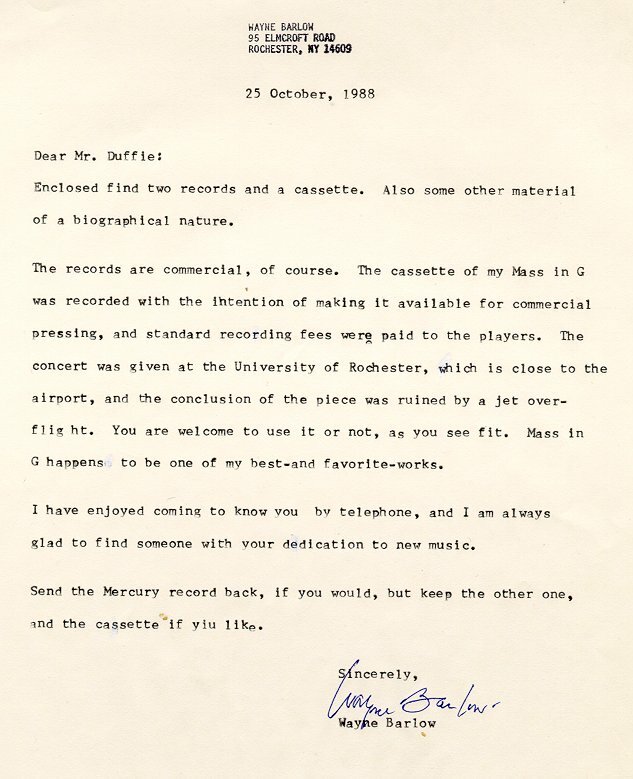 . . . .
Bruce Duffie: Since we’re talking about recordings, are you pleased with the two conducted by Howard Hanson? Wayne Barlow: Yes, I certainly am. I was very close to Hanson for many, many years, as a faculty member of the Eastman School. I studied with him, in addition to Bernard Rogers. They were my two principal teachers, along with a little exposure to Arnold Schoenberg when he taught at USC in the late 1930s. So it’s a varied kind of exposure to teachers. But I worked with Hanson very closely, and came to admire him. Of course, he was a tremendous conductor, so I have no quarrel with his treatment of my music. BD: Was that because he knew you and knew how you wanted it, or did he instinctively know how to play any kind of music? WB: I think both factors were involved, but basically he understands music. He spent his lifetime trying to do all he could for American composers, and in doing that job, he came to acquire a kind of instinctive knowledge about what American music was all about, and how it might possibly differ from French music or German music or whatever. So I do think that he came at it naturally and honestly. BD: Let me turn that question around to you. What is American music all about? WB: I don’t pretend to separate it in quite that way. 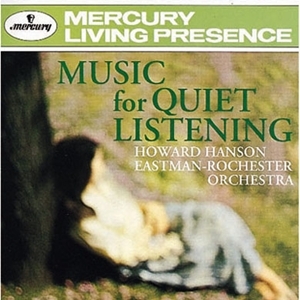 Howard Hanson did, and I think many others do. I try to keep more of a universal kind of outlook on music. 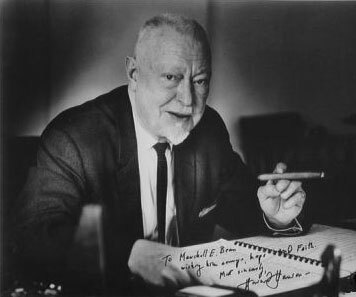 I really don’t think there is all that much difference between American music and most other kinds of music — Howard Hanson to the contrary notwithstanding. BD: Do you think that what differences exist are diminishing? BD: Like so many things, it is American by adoption? BD: When you’re writing a piece of music, you’re working on it and you get to the double bar, after you tinker with it, how do you know when to put the pencil down? WB: I write an awful lot of my music away from the piano. I get to the piano only when it’s mostly done, or when I reach a spot where I can’t quite work it out within my head. But I work basically melodically, and this is in the quiet of my study. When I get to the end of a section, I first of all go back and look it through, look it over in what notation I’ve put down, and then hear it — literally hear it — for piano or for orchestra or organ, or whatever. Sometimes this does result in stumbling upon a spot which doesn’t seem right to me, and then I do go back and I put a notation that something has to be done there. Usually it doesn’t mean very much, but it’s the slight tripping that occurs when the stride has somehow lost its momentum. After having made the correction, after I find it mentally, then I certainly will go and check it on the piano. This is the closest I can come to answering that question. I don’t think anybody ever writes a piece without ever making a change. Maybe Mozart did, but Beethoven made sketches which are full of changes, as we all know. I don’t think it’s anything to be worried about, but it simply reflects two composers’ different ways of doing things. BD: Once you get the piece done and it’s even been performed and published, is there any chance that you would ever go back and revise it or tinker with it a little bit? WB: Never. [Laughs] Never. That’s the short response! BD: So you’re completely satisfied with it? BD: In an earlier conversation, you said that one recording takes a section at a different tempo than you envisioned. How much interpretation do you allow, or even desire, when people play your music? WB: Oh, I’m all for differences in interpretation; I don’t have any quarrel with that whatever! However, there is another recording of Winter’s Passed, which I have not heard, and from the description that someone gave to me, it sounds like an absolute aberration of what I wanted. And it’s not because it isn’t written in the music. The tempos are clearly indicated with metronome markings. Why anybody should want to take it so terribly different from the indicated marking, I can’t even imagine! BD: The pieces of yours that I’ve heard have been basically tonal, almost neo-romantic. BD: I’m not trying to hang labels on you, but did you write it with this in mind, or did the compositions just come out the way they had to come out? WB: They came out that way because they had to come out. Winter’s Passed was written in 1938, and I just barely earned my Ph.D. in composition at that time! I was really still a student. Night Song was written in 1955 in Copenhagen, when I had a Fulbright. I taught some composition at the conservatory, and also commuted over to the University of Aarhus and lectured to students over there. But that belongs in a much later period, in spite of the fact that it’s basically a very tonal piece. Now this is not to say that all my pieces are quite that tonal, because I experimented to some extent with twelve-tone music. The last movement of the Dynamisms for Two Pianos is completely twelve-tone. But I think I borrowed an idiom of Stravinsky, one of whose great contributions to music, it seemed to me, was in somehow amalgamating the twelve-tone method with tonality. Schoenberg and his disciples never did this. They were always completely atonal, and would be horrified if anything in the way of a tonal landscape turned up in their music. But I think Stravinsky’s great contribution to music in that particular period was in somehow making the twelve-tone method more human. It brought to me what is almost an essential characteristic of music — if it’s going to be understood and completely enjoyed — which is some sense of tonality. So I think there’s a little bit of this Stravinsky kind of look at twelve-tone music in the last movement of Dynamisms. BD: These days we seem to be getting back to a trend where a lot more composers are writing a lot more tonal music. WB: Ah, yes. This is one of the things I was going to suggest, in case you didn’t ask me, because this is certainly one of the characteristics of the latter days of American music. In the last couple decades it’s been gradually moving in this direction. BD: Is this a good thing, or is it just a thing? BD: Then let me ask the big question — what is the ultimate purpose of music in society? WB: This falls directly in the same category as great art. You’d go to an art gallery to look at, and derive inspiration from, the great art and sculpture not only of the present, but of the past. I often do this. Certainly reading books belongs in the category, too, to a certain extent. It’s a window on life, looked at from the perspective of artists, authors, composers and anybody else who is trying to interpret their understanding of life in various ways. Music belongs exactly in this category. I love to go to concerts and hear what people are doing, not only in the present, but also to re-live moments of composers who I’ve come to admire. Maybe I haven’t heard a piece of theirs for a while, and I just renew my acquaintance with some of the composers of the past. To me it’s a fulfilling and uplifting experience. That’s where music belongs. BD: Then in music, where is the balance between an artistic achievement and an entertainment value? WB: [Laughs] Gosh, I’d never thought of that. I really don’t classify classical music. I don’t basically think of it as an entertainment, but I do think it has entertaining elements. Maybe there is an entertainment factor in concert music. Certainly there are many pieces which have entertaining elements to varying degrees, depending on the composer. I guess there’s really nothing wrong with it if a piece of contemporary music, or anybody else’s music which is supposed to be classical, turns out also to be entertaining. I’m not going to say that that’s wrong; it’s really not. That probably is a great achievement! BD: But it shouldn’t be written just to be entertaining? WB: No, that’s the point I guess I would like to make. BD: What are some of the traits that contribute to making any piece of music great? WB: In contrast to trivial? It has to do something with its materials in order to give it some sense of greatness. You can take the musical scale and you can write simple tunes which may be pleasant to listen to, but it won’t be great. You can also take the same notes of the C major scale and expand these tunes so that they become more than tunes. They become a part of a landscape, that allows the composer to use these tunes in ways in which they become constantly a source of wonder and admiration. I’m thinking of Bach of course, and I’m thinking of Beethoven, both of whom make something remarkable and wonderful and everlasting of their themes. These tunes become themes in the true sense of the word. A theme is something that runs through a piece of art or a piece of music, and this theme becomes varied. One of the things I love to do is write variations; it’s one of my favorite devices. It’s one of the ingredients of great music that a basic theme becomes somehow transformed in many, many different ways, depending upon the skill of the composer. It can serve as a basis for music of a very somber sort, and the same theme can be utilized in a scherzo, which has a completely different kind of scope. And a wonderful majestic finale of a large piece can be based on the same theme. So the composer’s skill in using a theme to fulfill many different kinds of feelings — from profound to humorous, perhaps — is one of the marks of a great composer. I think it boils down to the composer’s skill in utilizing his materials. Now the materials themselves, of course, have to be somehow capable of fulfilling all these transmutations that are in a composer’s mind, and not all tunes are going to be equally successful in this respect. But a great composer can do this. I don’t know how else to approach that subject. BD: You mentioned skill. Where is the balance, then, between the skill — or technique — and the original inspiration? WB: They’re part and parcel of practically the same thing. I think the skill is probably hidden in the composer’s drafts of a theme that he wants to use in a broad way in a large piece. Behind the notes that come down on his paper are feelings that are unthought of, consciously, in getting those notes down. These make the theme useful in the way that the composer wants to use it. The characteristics that make a theme useful in this respect are partly unconscious. If the composer has done this sort of thing many times before, he’s come to recognize what characteristics a theme ought to have to make it successful for a forty-minute symphony, let’s say. BD: When you start to write a piece, are you conscious how long it will take to perform the completed work? WB: Yes, I do have that. I think it dictates your treatment of the theme. If you don’t want to exceed twenty minutes, your approach to writing that piece is going to be quite different from one if you were going to write a long, fifty-minute symphony. BD: Are there ever times when you get a theme and start working with it, and you realize that you could utilize it for much more time than you’ve allotted in this piece? BD: Then do you use the theme twice, or do you put it aside? WB: You put it aside, and use it again, maybe! You save it. BD: When you’re writing a piece of music, are you always in control of that pencil, or are there times when that pencil is really controlling you? WB: I don’t recall being controlled by my pencil. [Laughs] Elements of the tune in question become very appealing, and as you write it down you may discover something that you hadn’t thought of when the tune first came to you. This may, in a sense, dictate what you’ve just indicated, that maybe the very act of writing it down and getting it out of your brain cells and onto paper in itself may spawn other thoughts about that tune. So in a sense, I guess, maybe it does write itself, from that standpoint. BD: You spent many years of your life teaching and doing administrative work. Did you get enough time to compose? WB: Oh, yeah, I think I did. I had a wonderful career there at Eastman. My administrative work was not completely demanding. I had a wonderful secretary who did a lot of this for me, so I had plenty of time to write. I don’t know how many pieces there are, but my dossier runs pages and pages. The beautiful part about that career at Eastman was the fact that Hanson [photo at left] was always anxious to perform the music, not only of people on his staff — and there were several of us composers who profited by his interest in American music — but music, generally, by Americans all over. We were constantly listening to music of other Americans; it was a wonderful kind of situation to be in from this standpoint. I never had the feeling that I was constrained, or that I didn’t have the time to devote to composition because of my everyday duties. BD: Was Hanson the Serge Koussevitzky of the university set? WB: I think so, yeah. That’s a fair analysis. He was a great friend of Koussevitzky, of course. He frequently would go up and conduct the Boston Symphony; Koussevitzky would invite him quite frequently. BD: Is the Hanson tradition at Eastman being upheld today? WB: Well, I don’t know if it’s too bad or not. The times change; personalities change. We have other composers at Eastman now who have more or less taken over, and that’s fine. I think it’s just the sort of thing that should happen, so I don’t feel bad at all. The Hanson years were wonderful years for all of us who were associated with him. I have nothing but wonderful feelings as I look back at these years from my ripe old age of seventy-five! BD: Now that you’re in your seventy-fifth year, what is perhaps the most surprising thing that you’ve noticed in music? WB: Gosh. The most surprising thing? BD: Surprising or interesting, or unforeseen. WB: Well, I’m not surprised at anything! [Laughs] I think music is capable of throwing surprises of all kinds, so I don’t really think of a single notable thing that happened in music that I would call a pleasant surprise or a nasty surprise. I just tend to accept what composers do, but even that doesn’t surprise me because composers are people; they have personalities. I get surprised at some things that happen in certain people’s music. I’m not going to mention any names, but sometimes I get surprised by what I don’t like in things that certain composers do. That’s as far as I can answer the question. BD: You began teaching in1938? BD: And you continued teaching, along with the administrative duties, right up until you retired in 1978? WB: Yes, that’s right. I got into the administration gradually. I started off in the Theory Department, and then added a little composition to my teaching later on. That is when I dropped the theory. BD: How did the students change in those years? BD: Can composition be taught, or must it be innate within each student? WB: I think that students can be taught. First of all, they have to have a modicum of talent, however you want to define that particular ingredient. But students can be taught, and I’ve always found them interested in what was going on in music. They are certainly interested in what the teacher can do to teach them to do their music better. This is done not by having the student imitate the teacher, but the teacher’s job is to point out, when he’s done an exercise, how it can be done better. This is not to have it end up sounding like what the teacher would like. This is what makes a good teacher. He starts with what the student has done, and makes it better in accordance with the student’s own outlook on music. And this is what I always enjoyed doing; I think it’s the way it should be done. BD: So then it’s the teacher that must be ultimately flexible? WB: Absolutely, absolutely! It’s a fairly often-heard criticism of some teachers that they tend to make their students sound like they do. That’s not an uncommon criticism that one hears in the music profession, and there were teachers that did that. I’m not going to mention any names, and some of them were quite famous names, but that is not the way it should be done, in my opinion. I think most teachers would agree with me about that. A good teacher makes an individual personality out of his composition student. BD: It’s wonderful that you would look at it that way. That’s a great boon to your students. WB: One likes to do all one can for one’s students, and to me, the important thing is to somehow open up the wonderful landscape that music can lay before a student who wants to compose. In so doing, this landscape must be the student’s own landscape, and how he sees the landscape. He shouldn’t see it through his teacher’s eyes; he has to see that landscape in terms of his own vision. If the teacher can succeed in doing that — in making a landscape for the student which is basically the student’s own — then that makes the teacher a great teacher, I think. WB: Oh, yes, I think so. I don’t recall any terrible performance. The music has been played by differing degrees of professionalism, from absolute professional symphonies and chamber groups with very good players to amateur groups, and I like both of them. The amateurs, in a sense, usually bring something kind of fresh to what you’re hearing, and that’s great. So I have no complaints. BD: Did you also do some conducting yourself? WB: Oh yes, I’ve done quite a bit of conducting — mostly of my own music. I enjoy conducting. Part of my career was as an organist and choir director in churches, so I have a heavy background in sacred music, and I’ve always enjoyed being able to conduct and play at the same time. I’ve also worked in churches with a choir conductor. We didn’t always agree on what we were going to do, so I was forced, inevitably, to play things at his tempo and the way he wanted it done. BD: Was one right or wrong? WB: No, not one right and wrong, just two different opinions about the characteristics that ought to be brought out in the music. So when I finally had the opportunity to work and to become combination organist and conductor, I was pleased and I had a wonderful time. Of late, I’ve become more interested in sacred music than any other kind of music. As a matter of fact, I’m almost doing nothing else but following this line of music exclusively. I was one of a number of composers who worked for Concordia Music Publishing House, which is a Lutheran organization. For many years, those of us who were in that stable of composers were asked to do all kinds of things with the hymn literature of the Lutheran Church. It was lots of fun, and I’ve got albums full of things that I wrote for the church. This gets me into at least a mention of this word Gebrauchsmusik. There’s nothing wrong with Gebrauchsmusik. This is music for use, and some of the best music ever written was music for use. Bach is the perfect example of this, of course. So this has pleased me very much. BD: When you’re writing a piece like this, are you conscious that it’s going to be for use, or is the compositional process pretty much the same as anything else you’ve written? WB: The composition process is exactly the same. You will be guided by the fact that you recognize it as such. I wrote four volumes of organ music, for example for this publishing house, and you recognize that they’re not all going to be top-flight organists. Some of them are going to be, perhaps, mere beginners. So you don’t write for the most experienced organist that ever lived, nor do you write it for beginners only. You strike a happy medium so that you write a volume of organ music which can be played by a large number of organists. BD: Is this a special challenge to you, to write something that is intrinsically musical yet technically not as demanding? WB: Oh, that’s no problem. That’s no problem. BD: Have you written other vocal music besides the sacred music? WB: I have a set of songs, a song cycle, plus some choral things. WB: [Laughs] I love to write for voice. I don’t know if it has any particular joys. I’ve not written a great deal of vocal music, but the performances I have heard of that which I have done, I’ve been very pleased with in general. I love the human voice, and I’m very pleased with the song cycle I wrote for soprano. That’s the only real piece I’ve done for solo vocal use. I tend to write more for chorus, and I love to write for chorus. BD: There’s no chance that the chorus is a dying art form? WB: Well, now that you mention it, I’m afraid it is. But in Rochester we have several excellent church choirs and we have an oratorio society, which is open to all people who can pass the entry exam, so to speak. They do wonderful work! There aren’t as many professional choruses, I think, as there once were, which is a pity, but I don’t think that the choral experience is ever going to die out completely. It’s hard for me to conceive of churches that have no choir, for example. BD: When you’re writing a concert work, are you writing for specific people, or do you write for the audience, or do you write for the players? WB: I’m writing for the audience, mostly, I guess, but also, if not more so, I’m writing for myself! I’m working, for example, on a large commission, a large choral work which will run forty-five minutes. The choral parts are already done, and I’m in the midst of scoring it now. This is a piece which was written on commission for the Brevard Music Center in North Carolina, and the chorus will be made up of high school students and older, and some of the faculty. The faculty will also do the solo spots. It’s a cantata. Now here I’m conscious of the fact that this is not a professional chorus, so the choral parts are fairly simple, but they’re still full of the kind of sound that I want to get from a chorus. It will not be a burden for this chorus to grapple with. If it were, the piece could never come off. From that standpoint, it is adapted to the resources at hand. Nevertheless, it’s a piece that’s given me goose bumps in listening mentally to it, and I think it’s going to be interesting, and hopefully more than interesting, an uplifting piece. BD: That’s wonderful when it give the composer the goose bumps first! WB: Yes! [Laughs] The text is from Revelation. It’s called The Seven Seals of Revelation, and it melds some of the prophetic books of the Old Testament with the Book of Revelation. Of course, they correspond exactly; they talk about the same things. BD: When you get a commission for a piece of music, how do you decide if you will accept it, or postpone it, or even turn it down? WB: I’ve never turned down a commission! I think I am smart enough to be able to write for almost any kind of musical aggregation that the person would like. I don’t think that bothers me at all. If they want a piece for piccolos and bass drums, I think I could write that! But of course, I’m delighted and honored when people do want something that I am happy to write, most of which involves the use of the chorus. I just love it! A lot of people know this, and this is why these things come my way. BD: Is the music of Wayne Barlow great? WB: Oh, I don’t worry about that. I think it has great moments. It’s probably not all great. I don’t think all of Beethoven’s music is great, either. BD: Is the public today making a mistake when they expect every new work to be a masterpiece? WB: That’s an interesting question. I’m sure that many people do expect a new piece to be a masterpiece, particularly something that the Chicago Symphony’s going to play. If the Chicago Symphony’s going to play that, it surely must be a masterpiece. So yes, I think that’s true. It may well be that they will occasionally be disappointed, but that’s inevitable too. I wish it could be otherwise, so that every piece any composer ever writes would be great, but not every piece I’ve written has been great, and I think that probably applies to most living composers. BD: When putting together programs, should we only play the great masterpieces of the past? WB: Oh no, I don’t think that! BD: So there is a place on the concert platform for the next level, and even the level under that? WB: Oh, I think so, sure. Gosh, that’s an awfully rarified atmosphere! If you are a conductor, how would you go about looking all your life for all the great music? Conductors have other things to worry about, such as making programs enjoyable. I don’t think all enjoyable music is great, but that’s not a reason it shouldn’t be played. BD: What advice do you have for conductors coming along? WB: Every conductor, of course, has his own notion of the sort of music his audiences ought to hear. You have to start with that premise, but at the same time, he has to recognize that not all members of his audience will necessarily agree with his choice of music that should be heard. He has to be very aware of that fact, and he has to be a master at putting programs together that will make a maximum amount of impact and enjoyability on the part of his audience. This music, whatever it is, ought to be played as perfectly as possible. When you get this combination of a program, which somehow is put together in an endeavor to please as many persons in the audience as possible, played as perfectly as possible, I think this is really all a conductor can do. BD: Is there such a thing as perfection in music? WB: Oh, I doubt it! But that doesn’t make it any less great. BD: Has the tremendous explosion of recorded material which is available helped or hindered this whole process? WB: Both, I think. It’s a hindrance in presenting so much to the person who wants to become expert in discovering what the past has done. All of a sudden he’s presented with not only the past, but also with what people are doing in the present. You come across this almost unending source of new sounds and new ways of using sound, all of which are going on simultaneously in the present. It is, I suspect, pretty confusing to a lot of people. On the other hand, the person who is willing to sift through it all and separate the wheat from the chaff, may be able to enrich his own art simply because he was able to come across things through the recording medium which otherwise he probably never would have come across. So I think in that respect, it’s all to the good. But this individual, who is working in the present, certainly has to be able to separate what is useful to him from that which is absolutely of no use whatever. He has to be selective. BD: Not just in music, but it seems in every arena today there is so very much to think about and consider, and that trove is always growing! BD: Oh, that’s a wonderful statement! It’s put together very, very well, and reflects your thoughts succinctly. WB: Well, it does, yeah. It’s been a joy to talk to you. BD: Oh, it’s been a great pleasure for me! I appreciate being able to chat with you. I look forward to the recordings and I’ll continue to play your music on the air! WB: Well, I’m very glad you called. You’re doing a lot for me, to give me a little exposure out there in Chicago. along with this personal letter. This interview was recorded on the telephone on September 10, 1988. Portions (along with recordings) were used on WNIB in 1992 and 1997. This transcription was made and posted on this website in 2010.